So you want to start attending estate sales and hunt for bargains? In my next series of blog posts I will discuss strategies for finding the best sales, how to negotiate the best bargain and when you should attend. Here is the question I am most commonly asked. How do you find out about estate sales? There a a lot of ways to find out about the next great estate sale. Here are a few of my “go to” resources to keep up to date. Both www.estatesale.com and www.estatesales.org will allow you to search by zip code within a set mileage radius. They feature listings primarily from estate liquidation businesses that pay a fee to have their sale promoted on the site. Because of this, you typically find well run sales and lots of photos of what you can expect to see at the sale so if you have multiple sales to choose from you can plan in advance on what you will hit first. Craigslist is also be a good resource but I prefer an aggregator app like Yard Sale Treasure Map that will pull estate sales and yard sale listings from a variety of media and aggregate them into one convenient location. You can search by radius and select the day of the week that you are going to go and the listings will be at your fingertips in an easy to navigate map! Just click on the pin and you can get directions to the event in Google maps. 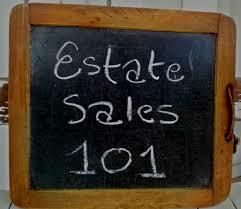 Thinking of hitting a number of estate sales or yard sales? Select the ones you are interested in and the app can create a route for you to follow. What a great tool! Can’t wait to start shopping? Visit Lizzie Tish Vintage and I’ll share some of my finds with you!